UPDATE: Ok, Forsythia`s foster mom has posted a video of Force in the morning. So, she gets up a little ... um ...excitable. She likes to hang out with other budgies later in the day, however. And is quite polite when she visits. So she would do fine as a neighbor, with other budgies in other cages. But, well --- check out her video: http://www.youtube.com/watch?v=59JuQ6c0wcU "That crazy Forsythia!" That`s what her foster mom calls her! Since Forsythia is cranky in the morning, her foster mom puts a sock on her hand while she gives "Forse" her veggies. Forsythia pulled on the sock so hard, she even pulled it off! So now they have a game of tug-of-war each morning. 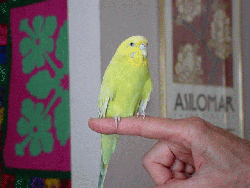 She`s also a scary-smart little budgie. When she didn`t get out of the cage for her afternoon play time, she figured out how to pull her water dish onto the floor (without spilling a drop!) so she could climb out the water dish door. Then she flew over to the neighboring bird cage and dumped various items off that cage, including some fairly heavy things (see video). So she needs her own sleep cage cuz she wakes up grumpy. But she still needs budgie friends (don`t we all?). I`m not sure exactly what to think about the world these days. I was part of a small community of budgies in a mixed-bird aviary. There were just four of us, two budgie couples. Then someone (not saying who!) laid five eggs that hatched into five naked baby birds that eventually turned into little green and yellow baby budgies. Well, like any good parents, we had to defend our babies, so we were very careful about all of the other birds in the aviary. Our person decided that we weren`t very good neighbors and asked Mickaboo to find us a new home. So then things got very confusing. We moved out the aviary and into a very nice flight cage with the babies. The babies grew up and left home (as babies do). And now we`ve moved to a new foster home as well. Once baby-raising was over, I started to display a different personality. While Mickaboo almost never encourages someone to adopt a single budgie (budgies being flock birds that really need other budgies for company), I`m an exception. I don`t really like being in a cage with other budgies because I get too aggressive toward them. Well, however, you describe it, I would be happy in a one-budgie household. I`m kind of grumpy in the morning. (Just feed me and leave me alone.) In the afternoon, however, I`m happy to come out and socialize -- shoulder surf, visit with the folks, you know -- be friendly! So, if you think you`re a one-bird person (and you`re not looking for that "early bird" -- whoever THAT is), I may be the budgie buddy you need!